Vehicles; a necessity that we can’t do without in the 21st century. Whether it be for business or pleasure, we rely heavily on motorised transport, and thousands of journeys are made on our roads each day. But as drivers, we have to understand that we have a crucial part to play when it comes to safety. We make journeys at high speeds, long distances, and in all types of conditions - from heavy rain to ice and snow - yet we’re often oblivious as to whether the vehicle we’re carrying our loved ones in is safe. Why don’t we know? In my opinion, it’s simply because so many people neglect the single most important thing when travelling by road: vehicle checks. "If I said the word FLOWER to you, you’d probably think of something pretty that smells nice. That’s not the kind of flower I’m talking about." FLOWER is a handy acronym that many in the automotive industry use to refer to vehicle checks. There are others, but I find this is the most common and the easiest to remember. You can even use FLOWERY! Fuel: How to check your car’s fuel levels. I’m sure you already know this, but you can check your fuel levels by looking at the fuel dial on your car’s dashboard. Always keep your vehicle filled with fuel above ¼ of a tank. This protects the fuel system from dirt in the tank and keeps you prepared for any delays you might face along the way. In winter, you should increase that minimum to ½ a tank to allow for poor weather issues. Top tip: Did you know the little arrow on the fuel gauge points to the side of the car the petrol cap is on? Lights: How to check your car’s lights. 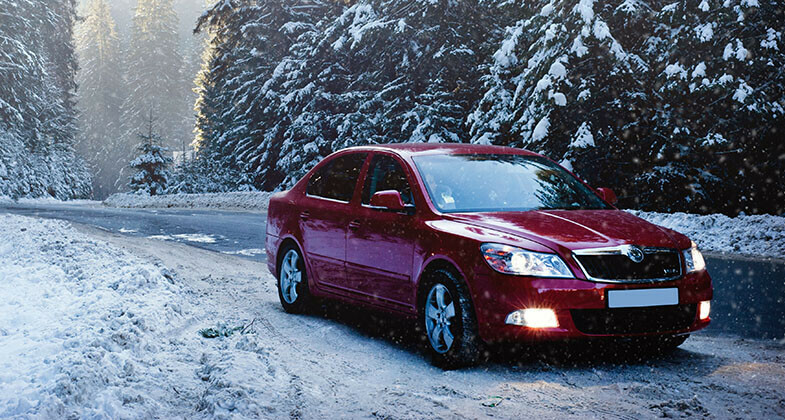 Before setting off on a journey, switch all of your lights on to check they’re working. Start with headlights (with main beam), hazards lights and fog lights. When you’ve got them all on, walk around the car, slowly, checking each light unit. Don’t forget to check the smaller lights like your number plate lights too. Reverse and brake lights can be done with a second person present or by simply using a surface such as a wall or garage door to see the reflections. Oil: How to check your car’s oil. It's imperative you check your oil regularly. Without oil your car engine will seize, causing a total engine failure leading to replacement or a hefty bill to repair. When the engine’s cold and on level ground, pull the dipstick out. Wipe all the oil from the dipstick (with a tissue, leaf or some paper) so it’s clean, and put it back in. Remove the dipstick once more, checking the oil on the stick is between the minimum and maximum. If you need to top up, use the correct oil as listed in your handbook or go to a car parts supplier. If in doubt, call for professional assistance. Over-filling can do as much damage as an under filled engine. If you don't have a dipstick, the car will check oil levels automatically using its own systems test when it starts up. If it alerts you that you’re low on oil, follow the onscreen instructions. Water: How to check your car’s water levels. I cannot stress this enough. Please DO NOT open a car engine coolant system when the engine is hot. The system’s under severe pressure and could cause serious injury to you and any other people standing close to the vehicle. Always check the water level when it’s cold. Normally allow 2 hours or more for the pressure and heat to disperse. Again, check it on level ground and be mindful if it shows that it’s below min and max. Many drivers believe they have to use “coolant” only. This is not the case. You can use water to top it up, but nearer winter get the antifreeze concentration checked and adjusted at a garage if required. Windscreen washer bottles are also a crucial part of Road Safety. It's an offence and MOT failure to take a vehicle on the road with an empty washer bottle. Keep it topped up with the correct ratio of water and screen wash to reduce freezing in winter and to maximise the cleaning effect. Electrics: How to check your car’s electrics. You might think I’m talking about your car’s lights and in-car entertainment, but there are many other parts of your car powered by electricity that need to be in good working order. This section refers specifically to things such as your battery, starter motor and wipers. It's hard to check these but you can listen and look for telltale signs that might warn you of potential issues. Does the car make noises when it starts? Does your engine not always catch and turn over? Those could both be signs that your starter motor is beginning to fail. If your car takes longer to start, or it turns over slower than usual, it could be your battery failing. Cold weather affects older and more used batteries very quickly. Most car batteries are now maintenance-free so when they die, they’ll require replacing. Rubber: How to check your tyres. Tyres are neglected far too much. Yes, you may have walked around, kicked the tyres and thought they looked fine. So what about the inside edge? How did you check them? It's easy to check your front tyres: you can turn the wheels on full lock, one way for one side and vice versa. That way you see the whole width. However, the back tyres are more difficult to check. You can't turn them on full lock, but you can do either of the following. Run your hands over the tyre slowly and lightly to feel the inside edge. Lean forward slightly, scanning the tyres with your eyes. In both cases, you’re looking for the tread wear indicators built in between the tyre tread. If the tread is flush with these, it's time to replace the tyre. Don't presume the tyre will wear evenly. And never presume that if you checked last month, it'll be the same this month. Potholes and bumps in roads change the vehicle's tracking and camber which, in turn, affects tyre wear. The photo above belonged to a taxi driver. He never checked the inside edge. He thought (wrongly) it would still be fine to drive on. He should have been turning the steering lock to lock as described above to check for uneven wear over the full width of the tyre. Being found with your tyre in the same condition as the one above will result in 3 points getting added to your licence or a fine and could even cause an accident. Below is a list of things you’ll need to check on those tyres. It’s a basic list and if you are unsure, get them checked by a professional. Simple checks that could save you money - and your life. I mentioned FLOWERY earlier, have you guessed what the Y stands for? Simple: Yourself! If you aren’t fit to drive, it’s an accident waiting to happen. Just tell someone and swap drivers. If there’s no one else, postpone the journey. And, without going in to too much depth, that’s pretty much it. These are the basics you need to keep you safe on the road, and most of it is common sense. I was always taught that if you look after something, it’ll look after you. It isn't difficult and will only take a few minutes. Get ahead of the game with our MOT checklist.